"There's little we can do for you." 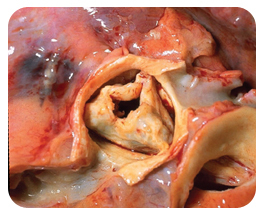 An image of aortic stenosis. and Prevention / Dr. Edwin P. Ewing, Jr.
For generations of patients with severe aortic stenosis who have been deemed too sick for surgery, this has been the harsh reality. However, a groundbreaking clinical study-called the Placement of Aortic Transcatheter Valves (PARTNER) trial-has opened the door to an innovative treatment option that is now offering many of these individuals a chance at life. Launched in 2007, PARTNER set out to compare transcatheter aortic-valve replacement (TAVR) with standard therapy in high-risk patients with severe aortic stenosis. During TAVR, a bioprosthetic valve is threaded through the femoral artery via a catheter and into the heart. Once in position, balloon valvuloplasty is performed to deploy the replacement valve and its frame within the diseased native aortic valve. The procedure is performed in a hybrid catheterization lab and, once perfected, takes less than an hour. Montefiore Medical Center is among the first wave of sites selected to launch a TAVR program in 2012. "Becoming a TAVR site was a very competitive process that required a lot of work and determination on the part of our medical teams," says Mario J. Garcia, MD, Professor and Chief, Cardiology, and Co-Director, Montefiore Einstein Center for Heart and Vascular Care. "It has been worth it, however, knowing that we can now offer this treatment to these very sick patients." A portion of the PARTNER trial-called cohort b-focused on patients who were not considered suitable candidates for surgery. "At one year, the death rate for patients enrolled in PARTNER cohort b who received standard therapy was 50.7 percent, compared to 30.7 percent in those who received TAVR," explains Joseph DeRose, MD, Director, Minimally Invasive and Robotic Cardiac Surgery, at Montefiore, and Associate Professor, Cardiovascular and Thoracic Surgery, at Einstein. "These findings showed that, for the first time, we can give these patients something we've not been able to in the past-an option." David Slovut, MD, PhD, Director, Advanced Interventional Therapy, and Associate Professor, Medicine, at Einstein, explains that the success of TAVR hinges upon close collaboration between cardiology and cardio-thoracic surgery. "Determining whether a patient is a candidate for TAVR and then successfully executing the procedure requires the expertise of both cardiologists and heart surgeons. While this procedure is currently performed by interventionalists, the surgeons-who have extensive experience in open valve surgery- bring an invaluable perspective to each case. There are important decisions to be made during these procedures, so it's nice to have more than one set of eyes in the room." Prior to receiving treatment, patients undergo an extensive evaluation to determine their eligibility for TAVR. The patient's case is then presented before a multidisciplinary team of experts who collectively decide whether the patient meets the predetermined criteria for surgery. Typically, candidates for TAVR are over the age of 80, have significant co-morbidities and are symptomatic -experiencing pain in the chest, shortness of breath or syncope. "This is without a doubt one of the greatest advances in cardiovascular medicine in the past decade," says Daniel Goldstein, MD, Director, Mechanical Assistance Program, Co-Director, Center for Advanced Cardiac Therapy, and Associate Professor, Cardiovascular and Thoracic Surgery, at Einstein. "That said, we need to be mindful that TAVR is very delicate technology and must be used wisely. We are taking a very cautious, systematic approach to deployment with the hopes of performing our first five procedures in early spring." "This is truly a proud moment for Montefiore," says Robert E. Michler, MD, Surgeon-in-Chief, Professor and Chairman, Department of Cardiovascular and Thoracic Surgery and Department of Surgery, and Co- Director, Montefiore Einstein Center for Heart and Vascular Care. "We care deeply about the well-being of our patients and invest a great amount of time and energy in helping them live long, healthy lives. Through TAVR we can finally offer that same hope to this fragile patient population." To learn more about Montefiore's TAVR program, visit www.montefiore.org/tavr . Patients are actively being evaluated for inclusion in Montefiore's TAVR program and can be referred by contacting Barbara Levine, Clinic Coordinator, at 718-920-7000.